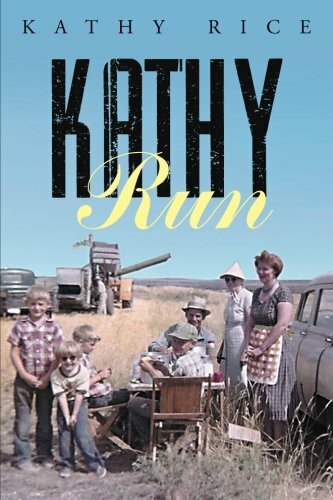 “Kathy Run” by Kathy Rice is a wonderful story about growing up in the 60’s without all the “extras” one has today. It takes place in Montana where we see the era move from horse and buggy to cars, where few families had indoor plumbing, TVs, or sometimes even electricity. It is about love and strength of family and community, and strong family values. Kathy’s story reminded me so much of my own life, growing up in the country, making do with what we had, and day trips into town. Each individual had their own chores which contributed to the family as a whole. There was little, if any, balking at what had to be done. If you did not do what you needed to do, the whole family did without. Kathy and her sibling’s school was one room that accommodated all with one teacher. Classroom supplies were limited and text books were out of date, which meant the teacher had to be very creative–and that they were. Each family that attended the school helped maintain it by doing repairs, cutting firewood, and helping with activities. The author has captured something that we as a society have lost: good old family values. She writes with ease, showing her passion and love for the craft. Her descriptions of her family and growing up transports readers back to a time where life was much simpler. For readers who grew up in this era, fond memories will reign. One of the things I loved about this book is that there was no violence, drugs, or sexual innuendos–just good old memories. She also provides numerous family pictures throughout the book, which adds to the overall presentation of the story. The author’s depictions of family members were just enough that readers will identify with them. I would love to read a follow-up to “Kathy Run” by Kathy Rice, to see where the siblings ended up and how they moved into the new era. Excellent writing and storytelling.